Unfortunately the weather did not cooperate for our fundraiser and kept many shooters away. However, $3000 was still raised to contribute to Meals on Wheels. Thank you to our sponsors and all of you who participated. April has arrived and the Annual Shareholders Meeting as held last Saturday. This meeting was open to shareholders only but much of the information discussed at that meeting will be found on our "About" page under the SPC Report for 2018. Also at this meeting Jack Kennedy and Chuck Manning were re-elected to serve as Board Members for the next two years. Other Board Members are Heather Jackson, Don McMoran, and Marsee Wilson, all who still have a year left on their term of office. Next Saturday is the annual "Meals on Wheels" Fundraiser Turkey Shoot. Come out and enjoy the fun as we raise money for the organization. The last Winter Handicap Shoot was held along with the Champion of Champions competition. See the "Results" page for the complete results. The PITA Registered Shoot was held and drew shooters from across the state and also Canada. Be sure to see the "PITA Results" page for a list of winners and pictures. 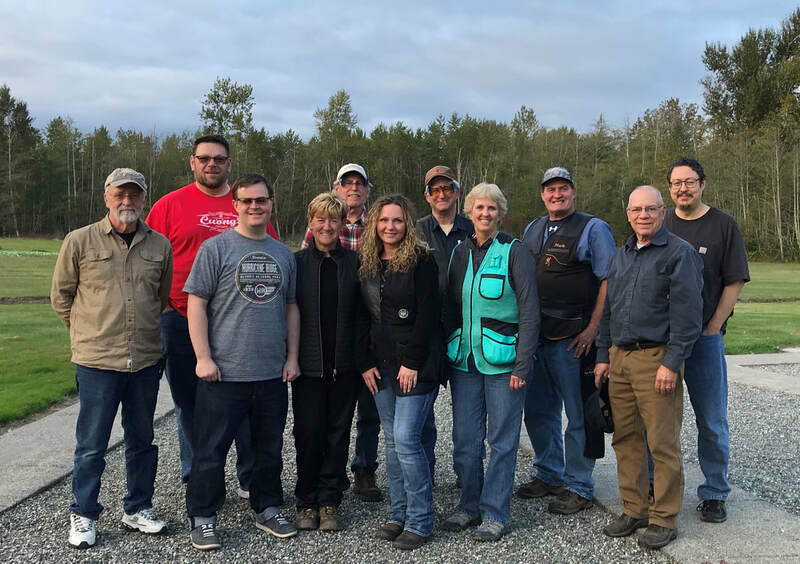 The International League also finished up with the annual banquet held at Ridgedale Gun Club, Canada. Old Skagit shooters did very well, particularly considering some of the weather issues. Again, see the "International League Results" page for a complete list of their accomplishments. This is a really fun league to participate in and also an opportunity to meet many different shooters and visit different clubs. During the month the .410 Gauge Championship Shoot also started and is continuing into April. If you own a .410 and want a new and 'interesting' challenge you might consider trying this. The International League Shoot is still planned for this coming weekend February 16 & 17. There will be no practice traps available on Saturday but the monthly fun shoot is still scheduled for Sunday. Thank you to everybody for making this another successful year for our fund raising for Toys for Tots. Many toys were collected to go along with $4200 in cash for this worthy cause. ​Ten shooters came together to participate in a 2-day clinic put on by Ms. Nora Ross, her 3rd class at our club. This year Nora used the same videotaping methods to show students how they handled the gun, stance & gun placement. Her verbal direction, reasoning, experiences & some training techniques deviated from last year’s clinic. She was not delivering the same information like a tape recording; it was tailored to the class & individuals. Amazingly, she can see small things that happen so fast affecting a shooter’s performance. I’ll be in her class next time she comes to town. Twenty-one shooters shot the program with several more shooters joining All American Armory for the new shooter orientation and instruction. Fiocchi provided the ammunition for all junior shooters and women that participated in the competition. All American Armory provided the ammunition for the new shooter orientation. Fiocchi provided gear bags and hats for all participants and the Gun Club provided targets for the new shooters. High Over All winner was Lewis Gravley with Sherry Greene taking High Lady and Tanner Huisman High Junior. Congratulations also go to junior shooter Karsen Pell and lady shooter Heather Jackson who both shot their first 25 straight in competition while shooting Fiocchi ammunition.